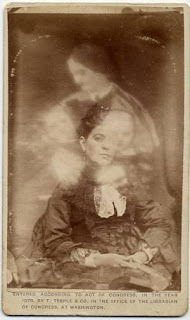 The nineteenth century was a golden age of spiritualism, so it’s not surprising that many murder stories from the 1800s have accompanying ghost stories. After her death, the spirit of Zona Heaster Shue appeared to her mother in a series of dreams. This prompted Mrs. Heaster to request the body be exhumed, revealing that her daughter had been murdered. Peter DeGraff was attempting to communicate with the spirit of Ellen Smith at the time of his arrest for her murder. The ghost of Louise Luetgert haunted her husband, Adolph, in prison after he was arrested for killing her and dissolving her corpse in boiling potash. She haunted Adolph until his death, then she haunted his sausage factory. In the house where Andrew and Abby Borden were murdered—now a Fall River, Massachusetts, bed and breakfast—guests still report strange visions and weird sounds. The Sprague Mansion in Cranston, Rhode Island, home of Amasa Sprague who was murdered in 1843, is allegedly haunted. It is uncertain whether the ghost is Amasa Sprague, or John Gordon, the man who was falsly accused of, and executed for, his murder. Savin Rock in West Haven, Connecticut is haunted by the ghost of Jennie Cramer whose poisoned body was found there in 1881. The body of Guilelma Sands was found in the Manhattan Well on January 2, 1800. Throughout the century people reported eerie sights and sounds coming from the well. Though the well is long gone, at the Manhattan Bistro, 129 Spring St., where the well once stood, Guilelma has been known to throw bottles off the shelf. No one seems to care that the ghost of Helen Jewett still walks the streets of Manhattan or that Mary Rogers haunts the New Jersey side of the Hudson River, though both murders are unforgettable. Then there is Lavinia Fisher. Since everything else about her legend is false, of course she has a ghost story. She still haunts the old jail in Charleston, South Carolina—her spirit, no doubt, disturbed by all of the false accusations of murder. There must be dozens of other tales from the spirit world accompanying the homicides at Murder by Gaslight, but I will leave them to someone else. I prefer the world of flesh and blood.